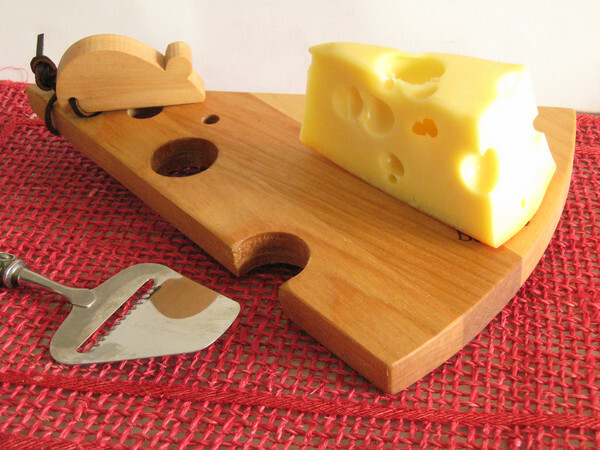 Crafted to resemble a triangle of Swiss cheese, this sturdy board is a perfect gift for any cheese lover. Nicely detailed wooden mouse, attached with a knotted leather strap, makes this board easy to hang for display. Easy to hold and features smooth edges for ease of cutting and spreading your favorite cheeses and other appetizers. Reversible two sided cutting board for everyday use.